I had the pleasure of covering the first day of the Mobile Health World Congress in Boston, which is a great event that draws an interesting crowd of leading industry thinkers representing all segments of the mobile health business. Several compelling start-ups debuted their apps at the show and numerous industry trends have emerged which I will feature in several posts over the coming weeks. The most predominate trend I gleaned from the presentations, product demos, and conversations I had with fellow attendees is the excitement about the so-called “gamification of health care”. Gamification is the idea that you can apply the basic elements which make games fun and engaging to things that typically aren’t considered a game, or in other words the use of game play mechanisms for non-game applications. Gabe Zichermann, writer at O’Reilly Media, defines the main purpose of gamification as helping people get from point A to point B in their lives. Zichermann and others believe many lack the “systems thinking (and discipline) required to get to that goal”, what games do well is expose complex learnable systems that users can engage with to achieve personal mastery “and thus accomplish something aspirational”. The one company most invested in the gamification of health concept is Humana, so it was fitting that Raja Rajamannar, SVP and Chief Innovation and Marketing Officer at Humana gave the opening keynote address, during which he featured numerous initiatives the company has launched over the past few years which he asserts are meant to “make fun things healthy, and healthy things fun”. The company has made impressive efforts to build social, virtual and mobile tools for their members to use, each highly personalized for a unique purpose specific to their health profile, but simultaneously community oriented and built around friendly competition and point-based reward systems. Actions and rewards are fundamental to the concept of gamification. The simplest form of rewards is points, the key question game developers need to answer is what actions or milestones are points awarding? The most popular gamification platforms are Zynga and FourSquare, which use points or badges to reward individuals as they accomplish certain milestones or surpass the achievements of fellow game players. These companies have come to define consumer expectations for gamified user experiences. 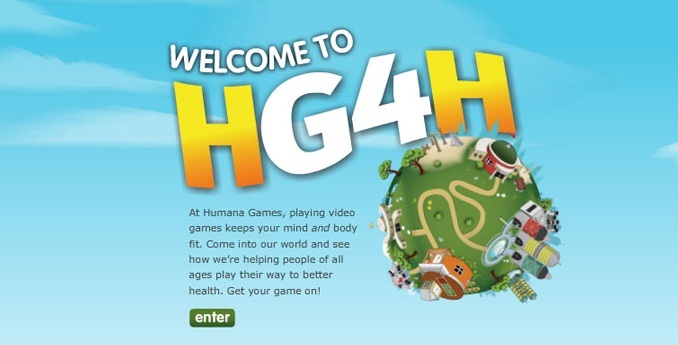 Humana Games for Health (HG4H) is a bold and innovative effort by the company to use “video games to keep your mind and body fit”. One of these games is the Humana Horsepower Challenge, which is profiled in detail in the presentation below from Slideshare. The challenge has one simple goal, to get children to be more active. It accomplishes this goal by distributing pedometers to each student in classes that enroll in the challenge. Each pedometer stores up to two weeks worth of data and wirelessly uploads to a remote access point (RAP), which is placed strategically in a location that the students walk past everyday. The kids are each given a username and password, which they can use to log into the site to see their personal step history as well as the cumulative steps of their class and other competing classes around the world. Each participating student can personalize their horse and each class earns currency they can use to upgrade their school bus, such as new paint colors, gold rims and a gold grille. Classes use the collective steps of all students to compete against other classes in a race around the world. Very cool stuff I wish we had when I was in fourth grade. Humana Vitality was launched in early July as a “sophisticated health-behavior-change model supported by an actuarially sound incentive program”. The program will be included with all Humana commercial members’ medical plans when they begin a new plan year. The “game” involves the player undergoing a health assessment to determine their “Vitality Age”, a scientifically calculated representation of their risk-adjusted, or “true” age, and allows members to easily understand how their current behaviors are impacting their health. The company also just launched HumanaVille, a “virtual neighborhood” connecting seniors (age 65+) with health and wellness resources. The company us hoping to tap into the growing interest in Internet activities among seniors The HumanaVille community includes locations and activities such as town square, health clinic, library, fitness center, games and relation spots. Users can interact directly through online chat and community discussion forums to post original content, ask questions and respond to one another. It’s clear that Humana is intently focused on becoming the leader in using game theory to improve their members’ tools for managing their health. Another company featured at the World Congress that is embracing game mechanics in the design of their mobile app is Medullan. 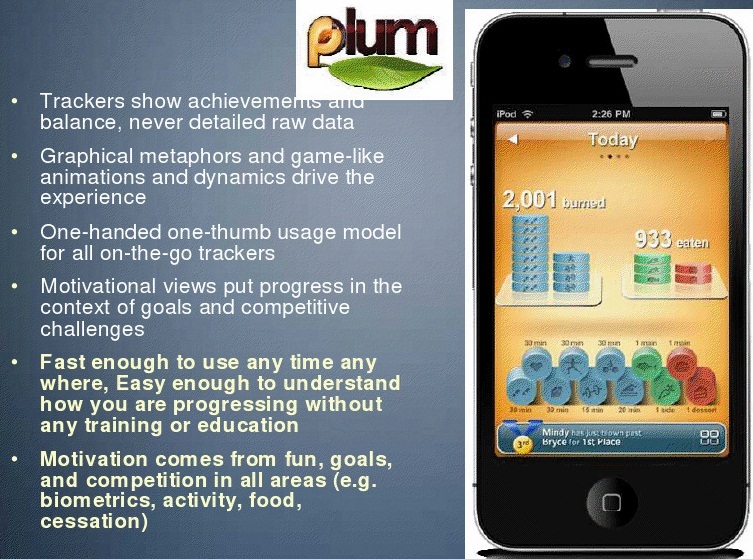 The company is based in Cambridge, MA, and is developing an app called Plum, currently in private beta, which Medullan refers to as a Workplace Wellness Engagement solution providing users simple, interactive virtual “trackers”. User interface is designed to meet the “one handed one-thumb” use model for all on-the-go trackers, such as the tracker meant to help users quit smoking which simply has users select a “street cone” each time they cheat and sneak a cigarette. The cone diverts the user from their previously smoke-free path and sends them back to square one on their track to accomplishing their self-assigned quitting goals. The coming wave of gamified mobile health applications will enable rich consumer experiences and allow users to leverage their increasing digital dependence on their Smartphone to keep their physical health in check and on target. Below you can see the Twitter flow and commentary from conference attendees, very interesting real-time feedback on the activities and ideas all shared under the hashtag #mhealth11. Great article Brian. Check out the open source gamification platform UserInfuser (http://code.google.com/p/userinfuser). We think it’s a great tool for new and existing sites to add gamification. We’d love to hear your thoughts on it.